"US Army Ranger" redirects here. For the racehorse, see US Army Ranger (horse). In 1622, after the Berkeley Plantation Massacre ... grim-faced men went forth to search out the Indian enemy. They were militia—citizen soldiers—but they were learning to blend the methods of Indian and European warfare...As they went in search of the enemy, the words range, ranging and Ranger were frequently used ... The American Ranger had been born. The father of American ranging is Colonel Benjamin Church (c. 1639–1718). He was the captain of the first Ranger force in America (1676). :33 Church was commissioned by the Governor of the Plymouth Colony Josiah Winslow to form the first ranger company for King Philip's War. He later employed the company to raid Acadia during King William's War and Queen Anne's War. Church developed a special full-time unit mixing white colonists selected for frontier skills with friendly Native Americans to carry out offensive strikes against hostile Native Americans in terrain where normal militia units were ineffective. His memoirs Entertaining Passages relating to Philip's War is considered the first American military manual (published 1716). Rogers' Rangers was established in 1751 by Major Robert Rogers, who organized nine Ranger companies in the American colonies. These early American light infantry units, organized during the French and Indian War, bore the name "Rangers" and were the forerunners of the modern Army Rangers. Major Rogers drafted the first currently-known set of standard orders for rangers. These rules, Robert Rogers' 28 "Rules of Ranging", are still provided to all new Army Rangers upon graduation from training, and served as one of the first modern manuals for asymmetric warfare. When the American Revolution began, Major Robert Rogers allegedly offered his services to General George Washington. Fearing that Rogers was a spy, Washington refused. An incensed Rogers instead joined forces with the Loyalists, raised the Queen's Rangers, and fought for the Crown. While serving with the British, Col. Rogers was responsible for capturing America's most famous spy in Nathan Hale. Not all of Rogers' Rangers went with him, however, including such notable figures as Israel Putnam. Later on during the war, General Washington ordered Lieutenant Colonel Thomas Knowlton to select an elite group of men for reconnaissance missions. This unit was known as Knowlton's Rangers, and is credited as the first official Ranger unit (by name) for the United States. This unit, however, carried out intelligence functions rather than combat functions in most cases, and as such are not generally considered the historical parent of the modern day Army Rangers. Instead, Knowlton's Rangers gave rise to the modern Military Intelligence branch (although it was not a distinct branch until the 20th century). Francis Marion, the "Swamp Fox" Revolutionary commander of South Carolina, developed irregular methods of warfare against the British army. As one of the fathers of modern guerrilla warfare, he is credited in the lineage of the Army Rangers, as is George Rogers Clark who led an irregular force of Kentucky/Virginia militiamen to capture the British forts at Vincennes, Indiana and Kaskaskia, Illinois. During the Black Hawk War, in 1832, the Battalion of Mounted Rangers, an early version of the cavalry in the U.S. Army was created out of frontiersmen who enlisted for one year and provided their own rifles and horses. The battalion was organized into six companies of 100 men each that was led by Major Henry Dodge. After their enlistment expired there was no creation of a second battalion. Instead, the battalion was reorganized into the 1st Dragoon Regiment. Several units that were named and functioned similarly to Rangers fought in the American Civil War between 1861 and 1865, such as the Loudoun Rangers that consisted of Quaker and German farmers from northern Loudoun County. They were founded by Captain Samuel C. Means, a Virginian refugee who was approached by Washington to form two detachments on June 20, 1862. The Loudon Rangers conducted periodic raids in Loudoun, Clarke and Jefferson counties. Military historian Darl L. Stephenson stated that a unit called the Blazer's Scouts were also a precursor to Army Rangers during the Civil War. Aside from conducting similar irregular warfare on Confederate forces in Richmond, Mississippi and Tennessee, its members were also descendants of the first ranger groups, organized by Robert Rogers in the French and Indian War. The Blazer's Scouts were instrumental in fighting off other irregular forces such as partisan bushwhackers and Mosby's Rangers, another unit of Rangers that fought for the Confederacy. Major General Lucian Truscott of the U.S. Army was a liaison officer with the British General Staff. In 1942 he submitted a proposal to General George Marshall that an American unit be set up "along the lines of the British Commandos". Currently no memorial exists at Pointe du Hoc to commemorate the actions of the 5th Rangers at Pointe du Hoc—only one to the members of the 2nd Battalion. However, the American Battle Monuments Commission (ABMC) have said that they will correct this error in the near future. The 5th Rangers along with members of the 2nd Btn (with 2 × 75 mm mobile half tracks) then went on to attack the Maisy battery which was still firing on both Omaha and Utah beaches. 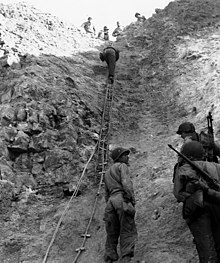 The 23 members of the 5th Battalion who reached and re-enforced the 2nd Battalion men at Pointe du Hoc on the 6th of June won the Presidential Unit Citation for the 5th Rangers—for the "Deepest penetration of any combat unit on D-day". Major Richard Sullivan (officer commanding) won the Distinguished Service Cross for three actions in Normandy: the landings on Omaha Beach, the relief of Point du Hoc and the successful capture of the Maisy Battery. After the first Quebec Conference, the 5307th Composite Unit (provisional) was formed with Frank Merrill as the commander, its 2,997 officers and men became popularly known as Merrill's Marauders. They began training in India on 31 October 1943. Much of the Marauders training was based on Major General Orde Wingate of the British Army who specialized in deep penetration raids behind Japanese lines. The 5307th Composite Group was composed of the six color-coded combat teams that would become part of modern Ranger heraldry, they fought against the Japanese during the Burma Campaign. In February 1944, the Marauders began a 1,000-mile (1,600 km) march over the Himalayan mountain range and through the Burmese jungle to strike behind the Japanese lines. By March, they had managed to cut off Japanese forces in Maingkwan and cut their supply lines in the Hukawng Valley. On 17 May, the Marauders and Chinese forces captured the Myitkyina airfield, the only all-weather airfield in Burma. For their actions, every member of the unit received the Bronze Star. On 6 June 1944, during the assault landing on Dog White sector of Omaha Beach as part of the invasion of Normandy, then-Brigadier General Norman Cota (assistant CO of the 29th ID) approached Major Max Schneider, CO of the 5th Ranger Battalion and asked "What outfit is this? ", Schneider answered "5th Rangers, Sir!" To this, Cota replied "Well, goddamnit, if you're Rangers, lead the way!" From this, the Ranger motto—"Rangers lead the way! "—was born. The next four Ranger companies were formed 28 October 1950. Soldiers from the 505th Airborne Regiment and the 82nd Airborne's 80th Anti-aircraft Artillery Battalion volunteered and, after initially being designated the 4th Ranger Company, became the 2nd Ranger Company—the only all-black Ranger unit in United States history. After the four companies had begun their training, they were joined by the 5th–8th Ranger companies on 20 November 1950. In Vietnam LRRP platoons and companies were attached to every brigade and division where they perfected the art of long-range patrolling. Since satellite communications were a thing of the future, one of the most daring long-range penetration operations of the Vietnam War was launched on April 19, 1968, by members of the 1st Air Cavalry Division's, Company E, 52nd Infantry (LRP), (redesignated Co. H, Ranger), against the NVA when they seized "Signal Hill" the name attributed to the peak of Dong Re Lao Mountain, a densely forested 4,879-foot (1,487 m) mountain, midway in A Shau Valley, so the 1st and 3rd Brigades, slugging it out hidden deep behind the towering wall of mountains, could communicate with Camp Evans near the coast or with approaching aircraft. On 1 January 1969, under the new U.S. Army Combat Arms Regimental System (CARS), these units were redesignated "Ranger" in South Vietnam within the 75th Infantry Regiment (Ranger) and all replacement personnel were mandatory airborne qualified. Fifteen companies of Rangers were raised from "Lurp" units—which had been performing missions in Europe since the early 1960s and in Vietnam since 1966. The genealogy of this new Regiment was linked to Merrill's Marauders. The Rangers were organized as independent companies: A, B, C, D, E, F, G, H, I, K, L, M, N, O and P, with one notable exception, since 1816, U.S. Army units have not included a Juliet or "J" company, (the reason for this is because, in olden times, the letter 'J' looked too similar to the letter 'I'). Companies A and B were respectively assigned to V Corps at Fort Hood, Texas, and VII Corps at Fort Lewis, Washington. Ranger training began in September 1950 at Fort Benning Georgia "with the formation and training of 17 Airborne Companies by the Ranger Training Command". The first class graduated from Ranger training in November 1950." The United States Army's Infantry School officially established the Ranger Department in December 1951. Under the Ranger Department, the first Ranger School Class was conducted in January–March 1952, with a graduation date of 1 March 1952. Its duration was 59 days. :28–29 At the time, Ranger training was voluntary. In 1966, a panel headed by General Ralph E. Haines, Jr. recommended making Ranger training mandatory for all Regular Army officers upon commissioning. "On 16 August 1966, the Chief of Staff of the Army, General Harold K. Johnson, directed it so." This policy was implemented in July 1967. It was rescinded on 21 June 1972 by General William Westmoreland. Once again, Ranger training was voluntary. :28–29 In August 1987, the Ranger Department was split from the Infantry School and the Ranger Training Brigade was established, commanded by Brigadier General (R) James Emory Mace. The Ranger Companies that made up the Ranger Department became the current training units—the 4th, 5th and 6th Ranger Training Battalions. :29 These units conduct the United States Army's Ranger School at various locations at Fort Benning, Georgia, Camp Frank Merrill, near Dahlonega, Georgia, and Camp James Rudder at Eglin Air Force Base's Auxiliary Field No. 6/Biancur Field, in northwest Florida. As of 2011, the school is 61 days in duration. In August 2015, two women graduated from Ranger School; they were the "...first females to successfully complete the notoriously gruelling program". After the Vietnam War, division and brigade commanders determined that the U.S. Army needed an elite, rapidly deployable light infantry, so on January 31, 1974 General Creighton Abrams asked General Kenneth C. Leuer to activate, organize, train and command the first battalion sized Ranger unit since World War II. Initially, the 1st Ranger Battalion was constituted; because of its success, eight months later, October 1, 1974, the 2nd Ranger Battalion was constituted, and in 1984 the 3rd Ranger Battalion and their regimental headquarters were created. In 1986, the 75th Ranger Regiment was formed and their military lineage formally authorized. The 75th Ranger Regiment, comprising three battalions, is the premier light-infantry of the U.S. Army, a combination of special operations and elite airborne light infantry. The regiment is a flexible, highly trained and rapid light infantry unit specialized to be employed against any special operations targets. All Rangers—whether they are in the 75th Ranger Regiment, or Ranger School, or both—are taught to live by the Ranger Creed. Primary tasks include: direct action, national and international emergency crisis response, airfield seizure, airborne & air assault operations, special reconnaissance, intelligence & counter intelligence, combat search and rescue, personnel recovery & hostage rescue, joint special operations, and counter terrorism. The Rangers have participated in numerous operations throughout modern history. In 1980, the Rangers were involved with Operation Eagle Claw, the 1980 second rescue attempt of American hostages in Tehran, Iran. In 1983, the 1st and 2nd Ranger Battalions conducted Operation Urgent Fury in Grenada. All three Ranger battalions, with a headquarters element, participated in the U.S. invasion of Panama (Operation Just Cause) in 1989. In 1991 Bravo Company, the first platoon and Anti-Tank section from Alpha Company, 1st Battalion was deployed in the Persian Gulf War (Operations Desert Storm and Desert Shield). Bravo Company, 3rd Ranger Battalion was the base unit of Task Force Ranger in Operation Gothic Serpent, in Somalia in 1993, concurrent with Operation Restore Hope. In 1994, soldiers from the 1st, 2nd, and 3rd Ranger Battalions deployed to Haiti (before the operation's cancellation. The force was recalled 5 miles (8.0 km) from the Haitian coast.). The 3rd Ranger Battalion supported the initial war effort in Afghanistan, in 2001. The Ranger Regiment has been involved in multiple deployments in support of Operation Iraqi Freedom since 2003. In response to the September 11 terrorist strikes, the United States launched the War on Terror with the invasion of Afghanistan in October 2001. Special operations units such as the Rangers, along with some CIA officers and Navy SEALs were the first U.S. forces on Afghan soil during Operation Enduring Freedom. This was the first large Ranger operation since the Battle of Mogadishu. The Rangers met with success during the invasion and, along with the other U.S. Special Operations forces, played an integral part in overthrowing the Taliban government. They also participated in the biggest firefight of Operation Anaconda in 2002 at Takur Ghar. In 2003, when the United States invaded Iraq, the Rangers were among those sent in. During the beginning of the war, they faced some of Iraq's elite Republican Guard units. Rangers were also involved in the rescue of American prisoner of war POW Private First Class Jessica Lynch. The 75th Ranger Regiment has been one of the few units to have members continuously deployed in Iraq and Afghanistan. In January 2016, the Taliban handed over Canadian hostage Colin Rutherford to Rangers and the FBI after Qatar arranged a prisoner swap with the Afghan government. Organizations both use and define the term "Ranger" in different ways. For example, the annual Best Ranger Competition, hosted by the Ranger Training Brigade, the title "Best Ranger" can be won by any Ranger qualified entrants from any unit in the U.S. military. For an individual to be inducted into the U.S. Army Ranger Association's "Ranger Hall of Fame" they "must have served in a Ranger unit in combat or be a successful graduate of the U.S. Army Ranger School." The Ranger Association further clarifies the type of unit: "A Ranger unit is defined as those Army units recognized in Ranger lineage or history." Acceptance into the U.S. Army Ranger Association is limited to "Rangers that have earned the U.S. Army Ranger tab, WWII Rangers, Korean War Rangers, Vietnam War Rangers, all Rangers that participated in Operations Urgent Fury, Just Cause, Desert Storm, Restore Hope, Enduring Freedom, and all Rangers who have served honorably for at least one year in a recognized Ranger unit." General John Stark - Commander, First New Hampshire Militia; coined phrase "Live Free or Die"
MSG Gary Gordon- Ranger and, ultimately, 1st SFOD-D sniper; Medal of Honor recipient; killed during the Battle of Mogadishu. LTG David E. Grange, Jr. - namesake of the annual "Best Ranger Competition"
SFC Matt Larsen - "father of the Modern Army Combatives system"; founder of the United States Army Combatives School; Director of Combatives United States Military Academy at West Point, NY. CPT Robert S. Mueller III, Second-longest serving FBI director in American history and Special Counsel in the investigation into Russian interference in the 2016 United States elections; inducted into the Ranger Hall of Fame in 2016. LTG Samuel V. Wilson - Chief Reconnaissance Officer / Intelligence & Reconnaissance Platoon Leader, 5307th Composite Unit (Provisional) (Merrill's Marauders); ultimately served as the Director, Defense Intelligence Agency (DIA) before retiring as a Lieutenant General in 1977. To date, the Rangers have earned six Presidential Unit Citations, nine Valorous Unit Awards, and four Meritorious Unit Commendations, the most recent of which were earned in Vietnam and Haditha, Iraq. ^ a b "Ranger Hall of Fame". U.S. Army Ranger Association. 2010. Archived from the original on 10 June 2014. Retrieved 6 July 2010. ^ Indian Narratives, 1854. Claremont, New Hampshire. Tracy and Brothers. pp. 262, 264, quoted in Black, Robert W. (2009). Ranger Dawn: the American Ranger from the Colonial Era to the Mexican War. Pennsylvania: Stackpole Books. pp. 7–8. ISBN 978-0-8117-3600-8. ^ Black, Robert W. (2009). Ranger Dawn: the American Ranger from the Colonial Era to the Mexican War. Pennsylvania: Stackpole Books. pp. 7–8. ISBN 978-0-8117-3600-8. ^ a b c d e f g Grenier, John (2005). The First Way of War: American War Making on the Frontier, 1607–1814. Cambridge University Press. p. 35. ISBN 978-1-139-44470-5. ^ Rankin, Nicholas (2008). Churchill's Wizards: The British Genius for Deception 1914–1945. Pennsylvania: Stackpole Books. p. 454. ISBN 978-0-8117-3600-8. ^ Katcher, Philip (1990). The American War, 1812–1814. Osprey Publishing. p. 27. ISBN 978-0-85045-197-9. ^ Bryant, Russ; Bryant, Susan. Weapons of the U.S. Army Rangers. Zenith Imprint. p. 18. ISBN 978-1-61060-084-2. ^ Urwin, Gregory J. W. (1983). The United States Cavalry: An Illustrated History, 1776–1944. University of Oklahoma Press. pp. 50–51. ISBN 978-0-8061-3475-8. ^ a b Richard E. Crouch. "The Loudoun Rangers". Loudon History. ^ Darl L. Stephenson. "Broom of Destruction: Captain Blazer's Scouts". West Virginia in the Civil War. ^ Matthews, David (November 13, 2012). "Andrew Jackson Cottage and US Ranger Centre, County Antrim". BBC History Magazine. Retrieved July 19, 2011. ^ Nadler, John (2006). A Perfect Hell: The True Story of the Black Devils, the True Forefathers of the Special Forces. Ballantine Books. ISBN 978-0-7394-6504-2. ^ "Birth of the United States Army Rangers". 2nd Ranger Battalion, Fox Company Living History Group. Archived from the original on November 18, 2008. Retrieved November 26, 2008. ^ "Small Unit Actions". American Forces in Action Series. Center of Military History, U.S. Army. 1982. Retrieved July 19, 2014. ^ "Ranger Handbook", Ranger Training Brigade, United States Army Infantry Center, Fort Benning, Georgia (2000) iii-2. ^ Wilkinson, Stephen, "Seven Most Daring Raids Ever: Army Rangers' Cabanatuan Rescue," Military History, Oct./Nov. (2009) p.35. ^ "Ranger Handbook", Ranger Training Brigade, United States Army Infantry Center, Fort Benning, Georgia (2000) iii-2-3. ^ Taylor, Thomas H.; Robert J. Martin (1996). Rangers, Lead the Way. Turner Publishing Company. p. 54. ISBN 978-1-56311-182-2. ^ "Ranger Handbook", Ranger Training Brigade, United States Army Infantry Center, Fort Benning, Georgia (2000) iii-3-4. ^ "V Corps Lurps, West Germany". 75thrra.com. ^ Ankony, Robert C., "No Peace in the Valley," Vietnam magazine, Oct. 2008, pp. 26–31. ^ Lewis, Jon E., ed. (2004). The Mammoth Book of Special Forces: True Stories of the Fighting Elite Behind Enemy Lines. Philadelphia: Running Press. p. 398. ISBN 978-0-7867-1427-8. ^ a b Voyles, CSM James E., "Vietnam Rangers (LRRP)," Gung-Ho magazine, Oct. 1984, pp.66–69. ^ Johnson, Frank (2010). Diary of an Airborne Ranger: A LRRP's Year in the Combat Zone. Random House. p. 8. ISBN 978-0-307-77509-2. ^ Boatner, John M. (1976). Military Customs and Traditions. Westport, Connecticut: Greenwood Press. ^ Ranger Training Brigade (13 April 2011). "Ranger Training Brigade Brief" (PDF). United States Army. Retrieved 24 April 2011. ^ "First Graduating Class". Ranger School Graduation Gallery. United States Army. Retrieved March 19, 2010. ^ a b c Lock, J. D. (2004). The Coveted Black And Gold: A Daily Journey Through the U.S. Army Ranger School Experience. Wheatmark Inc. ISBN 978-1-58736-368-9. ^ "1st women to pass U.S. Army Ranger School gain foothold for followers". CBC News. August 20, 2015. Retrieved January 21, 2016. ^ McManners, Hugh (2006). Ultimate Special Forces: The Insiders Guide to the World's Most Deadly Commandos. New York: DK Publishing. p. 68. ISBN 978-0-7566-1898-8. ^ "Ranger Handbook", Ranger Training Brigade, United States Army Infantry Center, Fort Benning, Georgia (2000) iii-4-6. ^ "Ranger History". Dept. of Military Science & Leadership The University of Tennessee. Archived from the original on August 21, 2008. Retrieved July 3, 2010. ^ The United States Army in Afghanistan: Operation Enduring Freedom. History.army.mil. ^ 3rd Battalion Retrieved July 13, 2016. ^ 75th Ranger Regiment Retrieved July 13, 2016. ^ "American Woman and Family Held for 5 Years in Afghanistan Freed From Militants". nytimes.com. ^ "Navy SEALs Were Ready if Pakistan Failed to Free Family Held as Hostages". nytimes.com. ^ "Ranger Handbook: SH 21–76" (PDF). Ranger Training Brigade, United States Army. February 2011. p. inside cover. Retrieved April 24, 2011. ^ "Join USARA". U.S. Army Ranger Association. 2011. Retrieved July 13, 2016. ^ "United States Army Rangers". Claim to Fame: Medal of Honor recipients. Find a Grave. Retrieved 12 February 2010. ^ Ogburn, Charlton (1956). The Marauders. New York: Harper & Brothers. p. 2. ^ "Indianapolis native Peter Kassig named next ISIS target". indystar.com. ^ "Medal of Honor Recipients Vietnam (A-L)". United States Army Center of Military History. ^ "Ranger Hall of Fame Master List" (PDF). ranger.org. 11 March 2019. ^ Calmes, Jackie (12 July 2011). "Rare White House Ceremony for Medal of Honor". The New York Times. ^ a b Medal of Honor Recipients – Vietnam (M-Z). History.army.mil. ^ Strum, Phil (May 31, 2010). "MEMORIAL DAY: Wrestlers who served in the military". Poughkeepsie Journal. Retrieved 15 April 2015. ^ a b "The Men In The Battle: Where Are They Now?". Seattle Times. February 9, 1998. Retrieved March 18, 2010. Wikimedia Commons has media related to United States Army Rangers.